The Leonova Diamond Aligner is a system for quick and reliable shaft alignment, suitable for most combinations of machinery and coupled or uncoupled shafts. 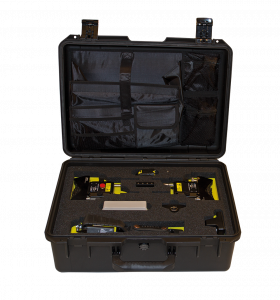 This a lignment system is designed for tough environments. The dual laser system comes with large, high precision digital CMOS linear image sensors, providing maximum accuracy. The IP65 rated sensors use digital signal processing to easily and automatically distinguish from interfering light sources. The sensors communicate with Leonova Diamond via Bluetooth (dongle included in the kit), enabling hassle free shaft alignment. 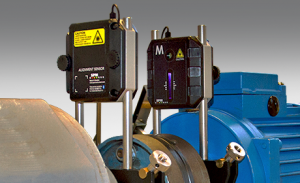 Dual axis high precision inclinometers measure the angle of rotation of both detector units at all times. This allows measurements in fully automatic mode, with much less than a half-turn of the shaft. The system comes with robust aluminum brackets and extendable chains for up to 480 mm (18″) diameter shafts. The Leonova Diamond instrument has a 4.3″ TFT-LCD backlit color display with a user-friendly graphical interface which guides the user through the entire alignment procedure. Automatic calculations and instant correction and alignment data result in a perfect shaft alignment. The system works with standard and user defin ed tolerance levels. A powerful ARM 400 MHz processor enables very short calculation times. The Leonova Diamond Aligner performs alignment calculations for horizontal as well as vertical or flange-mounted machines. Soft foot check, thermal growth compensation, and tolerance checks are built-in. The severity of the misalignment is indicated in green-yellow-red. The ‘Feet lock’ function automatically provides alternative alignment corrections, making the alignment procedure quick and easy. 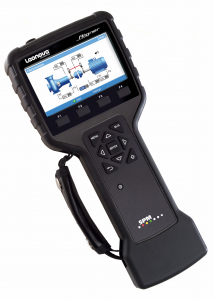 Measurement results are easily saved as user-named files, and alignment reports are generated in standard format for documentation and printing.The heavy-duty Leonova Diamond instrument is rated IP65 and drop tested to 1 meter.